Continuous positive airway pressure, or CPAP, is a method of improving the oxygenation of patients by providing a continuous level of positive pressure into the airway. In patients with sleep apnea or certain lung diseases, a drop in pressure at the end of expiration leads to a collapse of either the upper airway—as in sleep apnea—or the alveoli in the lower airway. According to "Clinical Anesthesiology," providing a constant level of pressure into the airways using a CPAP machine prevents this collapse and therefore improves the amount of oxygen that is transferred from the air the patient is breathing into their blood. This technique, however, is also associated with some adverse effects. In patients with sleep apnea, a decrease in muscle tone in the upper airways associated with falling asleep can cause a partial or complete collapse of these airways. This results in a cessation of breathing during sleep, snoring, and abrupt awakening in order to restore airway patency. The end result is increased tiredness throughout the day because of interrupted sleep. It can also result in long-term damage to the heart and lungs. A CPAP machine prevents this collapse of the upper airway. In addition, the microscopic air sacs known as alveoli at the end of a patient's airways can collapse when the patient has certain types of lung diseases. These alveoli are very difficult to open up once collapsed, requiring a large amount of incoming pressure. This increases the work of breathing and can, in severe cases, lead to respiratory failure. A CPAP machine also works to prevent this. Providing the airways with a constant level of pressure can also lead to some adverse effects in the lungs. If the alveoli at the end of the airway are distended too much, they block the flow of blood which normally passes nearby in order to pick up oxygen and drop off CO2. Blocking this bloodflow results in gas which does not participate in the exchange of oxygen and CO2, commonly known as deadspace. Excessive deadspace interferes with oxygenation just as surely as does ineffective ventilation. In addition, too much pressure in the lungs can result in trauma to the airways. The alveoli can be damaged, causing air to leak into the tissue of the lung, thorax, or skin. This can lead to potentially fatal complications such as pneumothorax. 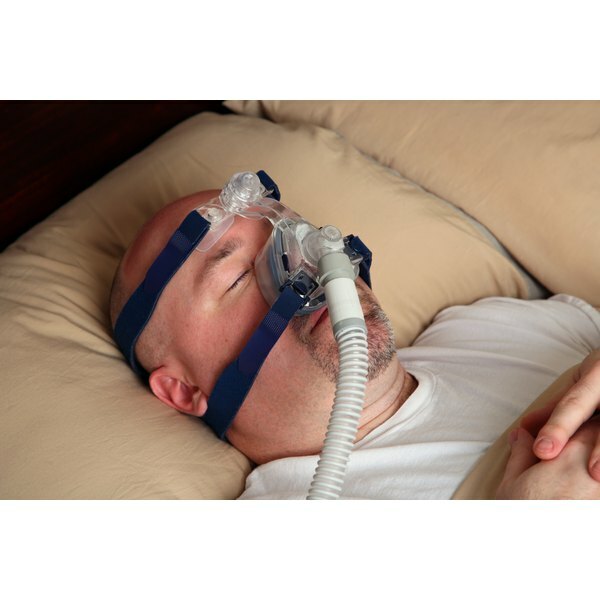 Excessive pressure delivered by CPAP can also cause complications outside of the airways. Increased pressure in the airways translates directly into increased pressure in the intrathoracic cavity, which can interfere with the function of the heart. The return of venous blood to the heart is accomplished, in part, by the negative intrathoracic pressure which occurs during inspiration. "Principles of Critical Care" states that interfering with this negative intrathoracic pressure with positive pressure can result in decreased cardiac output which can be potentially hazardous for people with pre-existing cardiac conditions. This also decreases blood flow to the kidneys and liver, potentially causing problems for patients with diseases of these organs. Ryan Doss began writing professionally in 2009 and has been published on LIVESTRONG.COM and eHow. He is a resident physician in emergency medicine. Doss has an M.D. from Ross University School of Medicine and a Bachelor of Arts in history and philosophy of science from the University of Washington.